Product #21932 | SKU SHM-ESG | 0.0 (no ratings yet) Thanks for your rating! 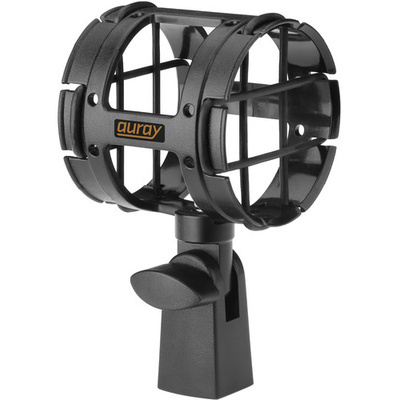 Catering to noise and vibration reduction for shotgun and small diaphragm microphones, the SHM-ESG Suspension Shockmount for Shotgun Microphones from Auray features ABS plastic construction with heavy-duty elastic bands that suspend your microphone and isolate it from vibrations and handling noise. The shockmount will fit microphones between 21 and 31.75 mm. It is fitted with a 5/8" thread for compatibility with most microphone stands, and includes a 3/8" adapter for further compatibility.